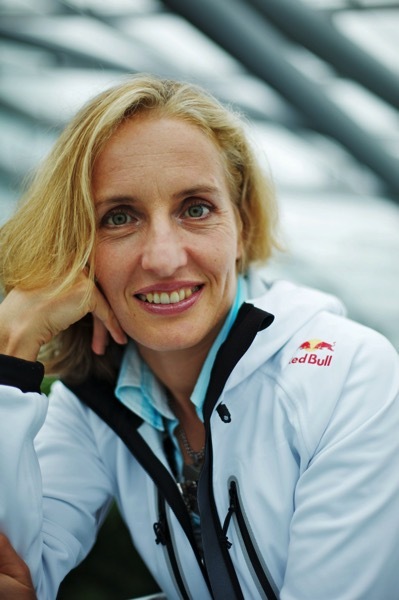 Natascha Badmann is one of the true legends of triathlon: She started her career in the early 1990 as a duathlete (winning a number of European and World titles over short and long distances) and had some success in short-course triathlon (including a European title in 1997). She is best known for her string of six wins in Kona between 1998 and 2005, racing with her trademark smile. Natascha has had a lot of ups and downs in her long career. 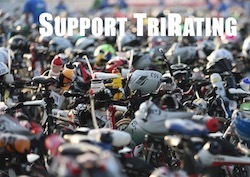 During the Kona race in 2007 she crashed on the bike, apparently trying to avoid a motor cycle in a construction zone. It took her a long time to recover from multiple injuries that threatened to end her career, only by 2011 she was able to finish her next Ironman race in Lanzarote. (She covers the Kona accident and her recovery in her book “9 Hours to Glory”, currently only available in German as “9 Stunden zum Ruhm”.) She won another Ironman race (IM South Africa 2012) and also raced well in Kona (14th in 2011, 6th in 2012, 14th in 2013). Her most recent race in Kona was in 2014 where she finished 24th after a flat tire. One of Natascha’s goals for the 2016 season was to race Kona one more time. She almost qualified under the KPR rules (ending up as the 5th alternate) and ended up with a wild card slot. 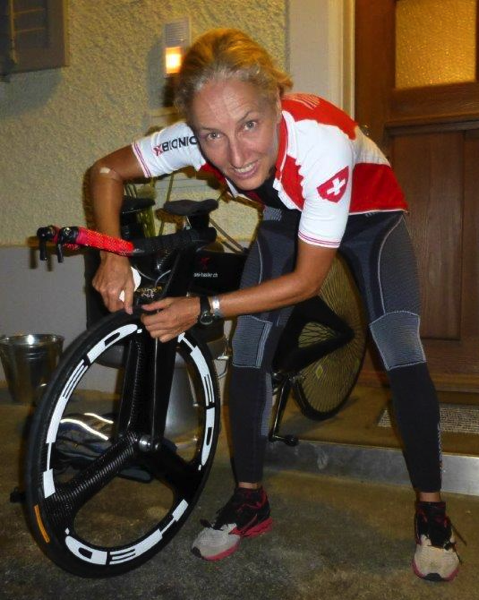 This post looks at Natascha’s path towards racing Kona 2016. To put Natascha’s plans for the 2016 season into context, one has to look at her 2014 and 2015 seasons. In early 2014 she was hit by a car when training on the bike. Originally she had planned to do IM Melbourne, but that was too close to the accident and she switched to IM South Africa, which was still to early and resulted in a DNF. In order to secure a last minute Kona slot she had to race both IM Germany and IM Switzerland just three weeks apart. Her Kona race didn’t go too well, she had a flat on the bike and finished in 24th place. In order to qualify under the “Kona Pro Ranking” Natascha would have to finish on the podium in three Ironman races and another two 70.3s between September 2015 and July 2016 – a lot of racing for an older athlete usually dealing with a niggle or two that makes even regular training a struggle. Just five weeks later Natascha started another Ironman race, IM Barcelona. She hadn’t yet fully recovered from Vichy and decided to end her race shortly after T2. “I’ve had the legs for a great bike split [4:40:22] – it would have been a new course record – but I wasn’t yet ready for a good run. I decided to save the energy for my next race.” Another five weeks later she took the long trip to Malaysia for her next Ironman race. This time she had another solid race: A well executed bike allowed her to run strong, finishing in third place – the minimum she needed to stay on her path to Kona. Natascha still wanted to qualify for Kona 2016 and after her 2015 results she was on track but still needed another good Ironman – and some points from 70.3 races. She decided to race the South American 70.3 Championships in early April as part of her build-up to her next Ironman race. Another niggle kept her from doing solid run training during the winter, but as 70.3 Brasilia was a higher points race, even an 8th place was par for Kona qualifying. She had to smile when five minutes before the start it was announced that the race would be delayed to wait for the sun to rise and much enjoyed racing in somewhat “less rigid” circumstances. Natascha planned to do her next Ironman in Brasil as well – the high-points race of Regional Championships in Florianopolis at the end of May would be a good chance to score the remaining points for her Kona slot. However her coach and partner Toni Hasler was in a bike crash. “Toni had some skull fractures, a broken collarbone and broken ribs that punctured his lung. Flying was impossible for him, and I wanted to care for him during his recovery. He was with me for all my ups and downs, and he was at my side in 2007 after my accident.” She changed her plans and targeted IM France in early June depending on Toni’s condition but also registered for IM Austria three weeks later. Toni was quickly feeling better and getting adventurous, but Natascha’s niggles kept her once again from decent training. They decided to scout the course of IM France – only to be robbed when thugs slashed their tires. (Luckily the most valuable things stolen were their laptops – not her one-of-a-kind Cheetah bike.) The race itself wasn’t much better: After getting beaten up for most of the swim, she was frustrated when big packs rolled by her in the early parts of the bike course. Once again she decided to save her legs for another race. Two weeks after Nice she raced 70.3 Italy. She placed sixth but crashed in rainy conditions on the bike and was barely able to finish the run. It was quickly apparent that she wouldn’t be able to race Austria or the European Championships in Germany one week later. Her last chance to qualify would be her home race, IM Switzerland. Natascha was barely able to race six weeks after her crash. Even so she posted up the second best bike split (behind Daniela Ryf who was on her way to the first sub-9 finish in Zürich) and reached T2 still in sight of the podium places. But her lack of proper run training showed and she didn’t have the run legs to place better than 9th. This left her as the fifth alternate in the July rankings. Improving her ranking and qualifying in August would have required her to place well in another Ironman – that would have been her sixth Ironman start within less than one year, in the hopes of racing another Ironman in Kona. However Natascha decided she wasn’t recovered enough to place well in another Ironman and was forced to accept that she wouldn’t be able to race Kona 2016. On September 17th Ironman announced the official Professional start list for Kona, and the last athlete on the list was Natascha with bib number 144: “To commemorate her retirement from professional racing” she had received a wild card slot from Ironman in order to be able to participate in the Professional wave. She has made it clear that this will be her last Professional race – and this wonderful gesture by Ironman allows her to end her extraordinary career in an appropriate location: Racing the Ironman World Championship in Kona, the site of her greatest successes.